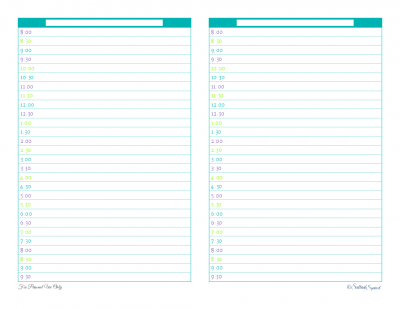 New Planner Printables as You Requested! We are halfway through February already, and you know what that means? It’s time for another Reader Request post. Out of all the posts I write, I think these ones are my favourites. I love nothing better than making up printables that you all ask for. This month I thought it might be fun to focus on planner printables. Out of all the requests that come my way, planner printables top the popularity chart, and as much I would love to make all of them, I had to narrow it down to just a few, at least for this month. So please take a peak and tell me what you think. This month I’m changing things up a little bit. Normally, I get requests for certain full-size printables to be made into half-size versions. I’m slowly working towards making all the printables here available in both sizes, but it takes a little time. This month though, I’m going in the opposite direction. 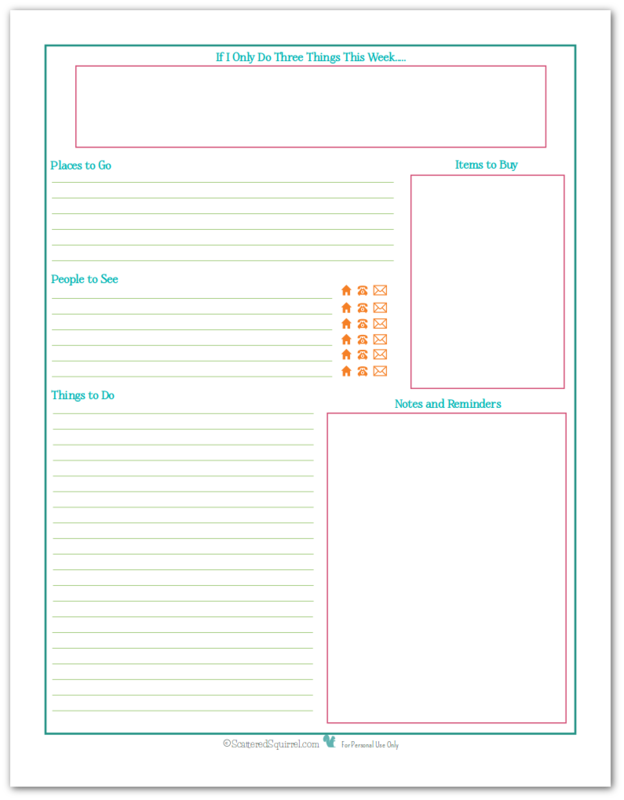 I’ve received a number of requests for full size versions of the printables shown below and I honestly can’t believe that in the (almost) three years I’ve been sharing printables here, I have yet to make a simple, full-size daily agenda. No fuss, no muss, just an agenda. Crazy right? I thought so. I also thought it was time to rectify the situation. I kept the daily agenda super simple and just made a full size version of the one above. This allowed for more time slots to be added. Don’t worry if you don’t need all the times, use those extra slots for notes. I actually took this one for a test drive today, and I have to say, it’s been doing great at keeping me on track and I’m loving have the extra room to add a little more detail into each task/appointment. It makes me wonder why I didn’t do this sooner. Sometimes simple really is the best way to go. Simple seems to be the running theme this month with the printables. 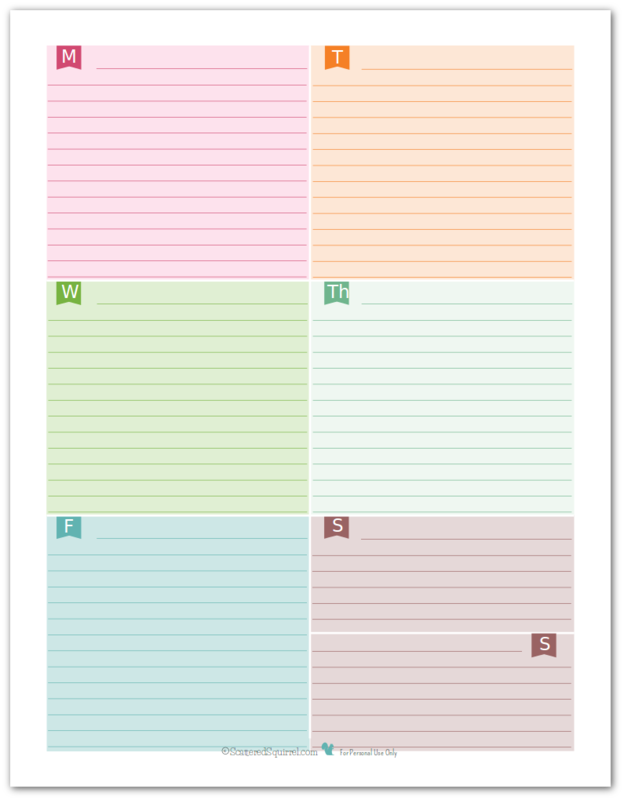 I didn’t do anything to change the weekly planner printable either, I just redesigned it to be full-size. Since so many of the requests that I get for this one always mention the colours, I opted to leave those the same. I’m thinking I might make a few more with some different colours. If I did would anyone be interested in them? Leave me a reply in the comments if you would, and let me know what colours you’d like to see. This one wasn’t exactly mentioned in any of the requests and I almost left it out since I do have another version of the weekly to-do list printable, but this one is cleaner and well, to repeat myself, simpler. And, ok, if I’m being totally honest, it felt kind of weird to break up the set. Yes, I know, I’m a strange duck…err… squirrel!?!? So, I mentioned above that I’ve been trying to offer both full and half-size versions of all the printables. These ones below are the exception to that. I tried making half-size versions, but because of the odd size of the boxes it just didn’t work. They ended up being pretty squishy and I just couldn’t bring myself to put them on here. If you really want them, I’ll play around a little more, but they won’t be very usable. The full-size version, however, turned out better than I thought they would. First up, are the more traditional, start on a Sunday calendars. I made both a blank and lined version. If you opt for the lined version, let me know how that works out. If it works out well, I’ll start adding in a lined version to all my calendars. Did I really just type that? That’s a lot of calendars to update! But I meant it, if you like the lined version let me know, I’ll work at updating the other ones as time allows. Speaking of other ones, back in October you surprised with how well received the monthly calendars starting on Monday were. 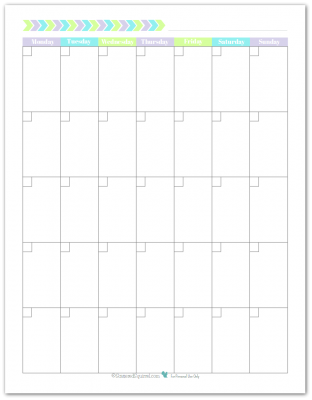 So, it should come as no surprise that I made a second version of the new blank calendars with the non-traditional, start on Monday twist! Which one depends on your browser and your browser settings. Also, please remember that the printables shared here are free for personal use only. 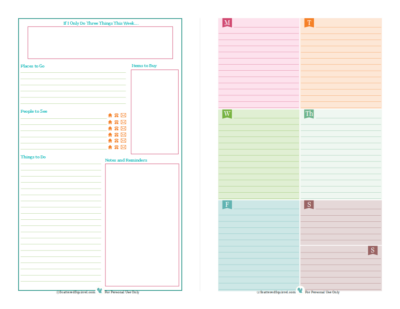 So, tell me true, what do you think of the new versions of planner printables? Don’t forget to let me know in the comments if you would like to see some different versions of the weekly planner printable, and what colours you would like to see it offered in! Do you have a suggestion or request for a printable? I’d love to hear from you if you do. Linking up at these places around the web. Thanks Cindy. I’ll see what I can do about your request. The dates might not be possible, but I’ll see what I can do. I’m glad you like them. Honestly, I never thought of putting lines in the boxes. I’m so glad people requested these. I tried the calendar with lines and it only does the frist two days. Any idea why? Thanks so much, the are GORGE!!!! Just precious! Hi Brenda, that is so weird. I’m not sure why it’s doing that for you. Maybe try downloading it a second time. When I downloaded them just now they all turned out like they were supposed. Sometimes files get wonky during downloading. Thanks Karla, I hope you find a couple that fit your needs! Wow, you sure do some beautiful printables–and I mean that. I love the boxed and colorful weekly version. That would work better than the one I have now–thanks! I love the Places to Go, People to See to do list. I might have to print that one out and put it to the test! Thanks Clare! It’s been super helpful for me to have them listed out that way. It sort o allows me to plan a little more the week or day. If I have to see a lot of people in a week I know I need to make sure I’m taking some extra alone time to help balance it out or I end up a jumbled ball of raw nerves. These are so cute and functional. You are very generous to share! Thanks for sharing this at What We Accomplished Wednesdays! Have a super week! Thanks for hosting such a fantastic party! I always find so many wonderful posts at your party. I love these but I use the half page sizes. 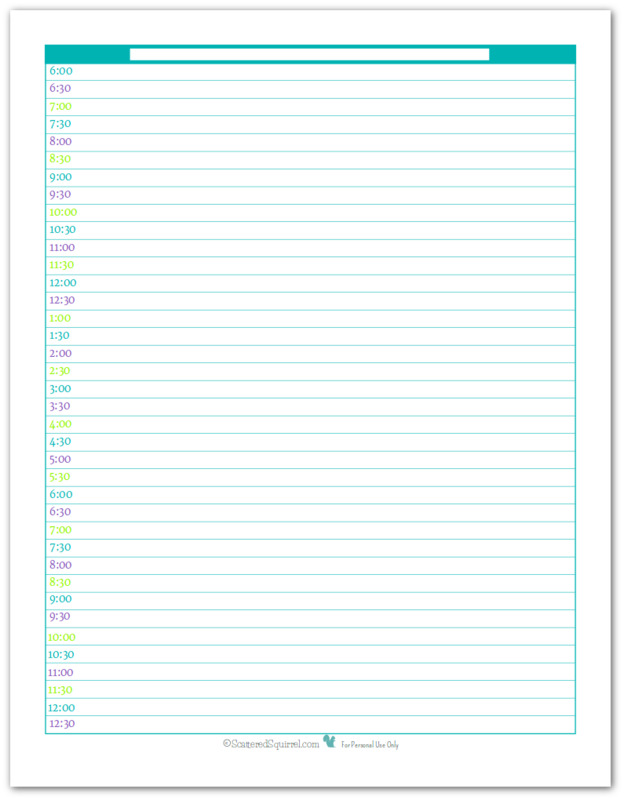 Could you make half size 2 page monthly spread with lines please! HI Nikole, I’ll add those to my list of printables to make. I don’t know when I’ll get them done, but I’ll try to make sure they get done at some point. Hi! 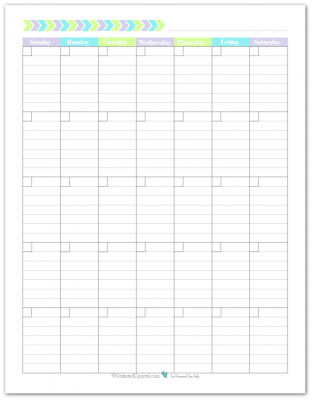 I love your printables, but the weekly planner with the colourful squares doesn’t link to a pdf, it’s just an image. Hi Jade, I’m so sorry for my late reply. Thank you so much for letting me know that the weekly wasn’t linking right. I’m not sure why, but sometimes the links go wonky on occasion. With so many printables on the site, it’s hard to check them all on a regular basis to make sure the links are working, so I greatly appreciate the heads up. It’s all fixed now. Again, I’m so sorry I was so late in replying.